So contacting a golf ball an inch off the center of the clubface with a 100 mph swing speed results in a 31 yard loss of distance. Now you may think that today’s equipment have larger sweetspots, but they don’t. A club manufacturer cannot increase the size of a golf club’s sweetspot. The sweetspot on a club is tiny… about the size of a dime. But what a club manufacture can do is increase the moment of inertia. Or in other words, resist twisting when you hit a shot off center. Now I don’t want to get too deep into that stuff because I don’t think it will help you much. But what I am going to add is that golfers who suffer from too much of a slice will generally hit the ball more out of the heel of a clubface. And golfers who suffer from too much of a hook will generally hit the ball out of the toe of a clubface. The ideal is, of course, to hit the ball in the middle of the clubface as often as possible… and the more you can do that the lower your handicap will be. I have seen numerous tests that show the better the player, the more consistently they hit the middle of the clubface. Here is picture of an old Tiger Woods 8 iron to show you how consistently he hit the ball with that club. Ok, we both agree that to lower your handicap and to hit the ball better, you need to hit the ball out of the middle of the clubface more consistently. How can you do that? Is hitting ball after ball going to help you do that? Most probably not UNLESS you have feedback on each shot to know where you just struck the ball on the clubface. But I have a better way than that. And it’s a way that does not require hitting a ball. Well, hitting a ball hard anyway. Now the thing with Hogan was that he was always working on improving his swing, right? There is a home movie on Youtube of Hogan on a beach in Florida showing his friends him swinging in slow motion, and he says that’s how he used to practice. At the end of this article I will give you a link to a Youtube video showing Ben Hogan doing this. Anyway, we have agreed that hitting the ball out of the center of the clubface more often would help you to hit the golf ball better, so here’s what I propose you do to make that happen. Every day at home get out your 5-iron and a golf ball and find somewhere that you can swing your golf club in slow motion. When your golf club approaches impact make sure that you strike the ball out of the center of the clubface, because by doing that you will be training your body to do that at full speed. 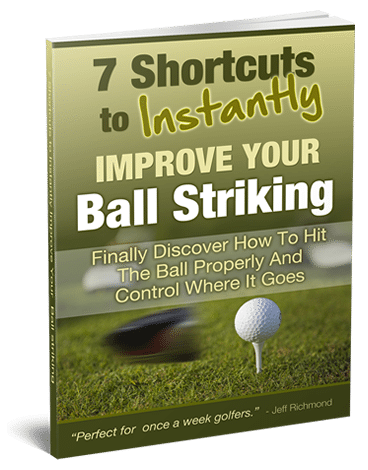 This is such a simple way to improve your ball striking – indoors at home! It’s what Hogan did, and what you can now do to improve your ball striking. But be warned, this is simple to do but not easy. Swinging in slow motion is quite hard on your body. That’s why you should limit this to only 10 QUALITY swings at one time. If you want to do this more often I suggest you have a rest for a few hours after one set of 10 swings and then do another set. This is all about quality not quantity. You are training your mind and body to do what you want it to do during the swing and, most importantly, at impact. 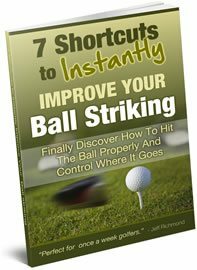 So there you go, that’s something simple you can do to improve your ball striking at home. To finish, here is the video of Ben Hogan practicing his swing in slow motion.